We knew the cannabis market was hot, but the latest studies show the cannabis industry skyrocketing beyond analysts’ previous expectations. Surprised that legalization and demand are expanding the cannabis market at such an accelerated pace, analysts are scrambling to revise their projections upward. “While it seems every year means a new monstrous projection about the size of the cannabis market, this year’s projection is especially large,” cannibisnow.com reports. The latest “State of Legal Marijuana Markets” report by Arcview Group and BDS Analytics, which cannibisnow.com considers the “gold standard of marijuana industry data research,” shows the global legal cannabis industry tripling over the next five years, reaching $32 billion by 2022. Grand View Research’s recent study sees the global medical marijuana market reaching a value of $55.8 billion by 2025. Over the past few years, the number of companies operating in the cannabis market has increased exponentially, the study says, and the market is expected to expand significantly because of legalization in several countries and the high demand for medical and recreational cannabis. Even these bullish forecasts pale in comparison with that of European investment bank Bryan, Garnier & Co., which sees the legal global cannabis market poised for growth of more than 1,000% over the next decade, reaching $140 billion by 2027. Similarly, Market News Updates reports that the international cannabis industry “continues to blaze red hot” based on the findings of the Brightfield Group, which sees the market growing at a compound annual growth rate of 60% each year and reaching more than $30 billion by 2021. As with other market analysts, the Brightfield Group sees deregulation and increased consumer interest as the driving factors. Arcview VP David Abernathy said the most surprising thing contributing to the cannabis market’s accelerated growth this year was the rise of international markets. Arcview analyst Tom Adams agreed, arguing that Germany’s move to make cannabis flower available for medical use in pharmacies was the big news of 2017 from a worldwide perspective. “The tables have turned in favor of legalization across the world,” said Adams. Grand View Research sees Europe eclipsing North America as the largest market for legal cannabis by the end of its forecast period, with a 55.6% share in 2025. Arcview voiced a similar view, noting that Europe, which has 739 million people and more than $1.5 trillion in healthcare spending, has the potential to be the largest medical cannabis market in the world. South America and Australia also are seen as large burgeoning markets. As money.cnn.com reports, the game is about to get a lot bigger as more and more North American territories join the legal cannabis market. In California alone, the opening of recreational dispensaries in January boosted the pool of legal marijuana users from 17 million to 47 million. 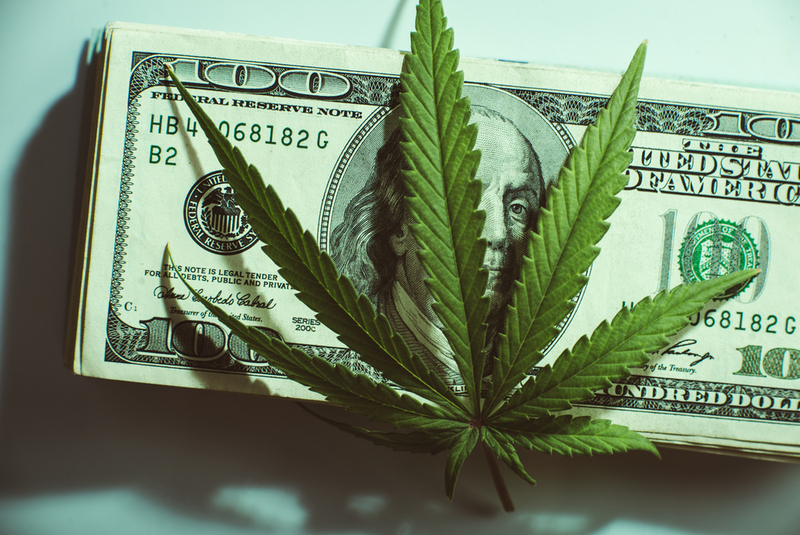 Analysts see the North American cannabis market accelerating further in 2018 as legal markets begin taking off in Canada, Massachusetts, Florida, and Nevada, with Maine, Vermont, Arkansas, Montana, North Dakota, West Virginia, and very likely New Jersey, Michigan, Oklahoma, and Arizona following suit. In sizing up the surging cannabis market, Bloomberg observes that sales of legal marijuana are projected to eclipse those of soda pop in 2030 based on Cowen & Co.’s projection that the U.S. legal cannabis industry will reach $75 billion in sales by 2030. Comparing cannabis with other commodity markets, a case can be made for the cannabis market being larger than that of corn, cotton, wheat, and coffee based on UN data that valued the illegal cannabis market at more than $140 billion in 2003. The global market for coffee, which is one of the world’s most valuable commodities, is valued at about $100 billion per year. As cannabis legalization becomes more widespread and cannabis production increases, the price of cannabis will continue to drop, which will continue to put pressure on manufacturers’ margins. Since 2015, the wholesale price of marijuana has fallen from around $2,100 per pound to $1,600 per pound. For cannabis manufacturers, competition will intensify as investment dollars pour in and more producers enter the market, causing margins to shrink even further. Besides successful branding, manufacturers will look to gain competitive advantages by employing advanced cultivation technologies and cannabis management systems that streamline operations, control costs, and maximize efficiency. As the maker of the most modern, integrated, and scalable cannabis manufacturing solution, MaxQ has deep cannabis industry expertise. Contact us to learn more about the latest trends and management solutions in the cannabis manufacturing industry. 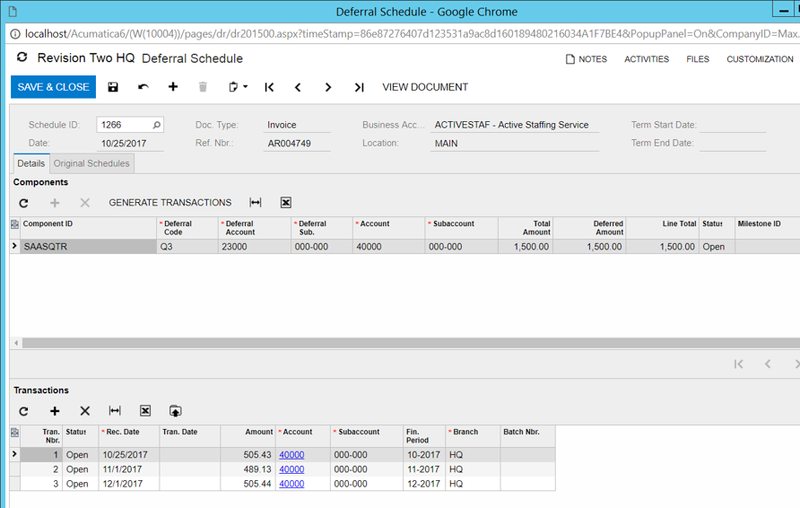 How Do the Different Revenue Recognition Methods in Acumatica Affect Revenue Recognition? 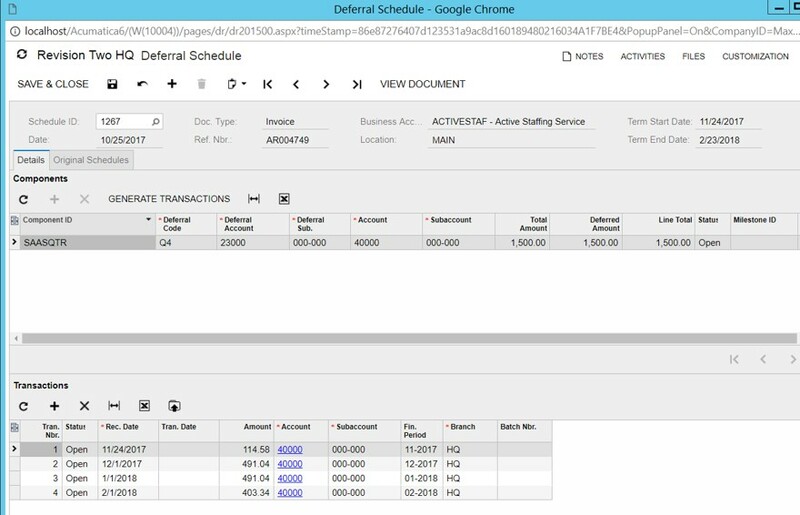 QUESTION: How do the different revenue recognition methods in Acumatica affect revenue recognition? ANSWER: Recognition methods determine how a deferred revenue or expense amount will be distributed over a defined number of periods. 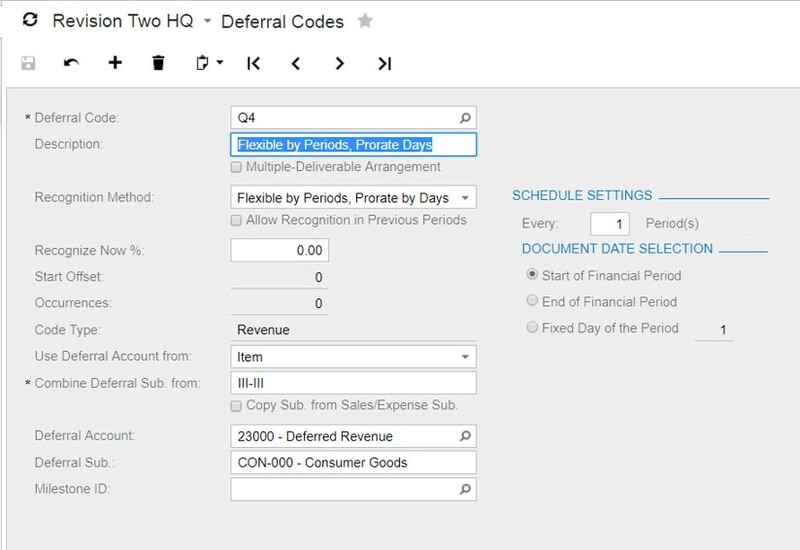 Within Acumatica, you can specify a particular recognition method in the settings of each deferral code on the Deferral Codes form, and can assign a deferral code to a line of an invoice or bill. 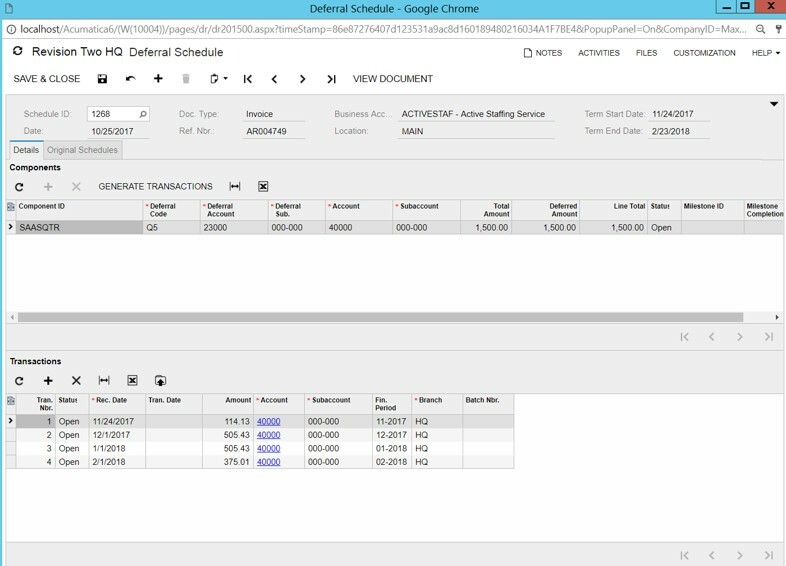 Revenues can be deferred in a number of ways and over different time periods that you select. 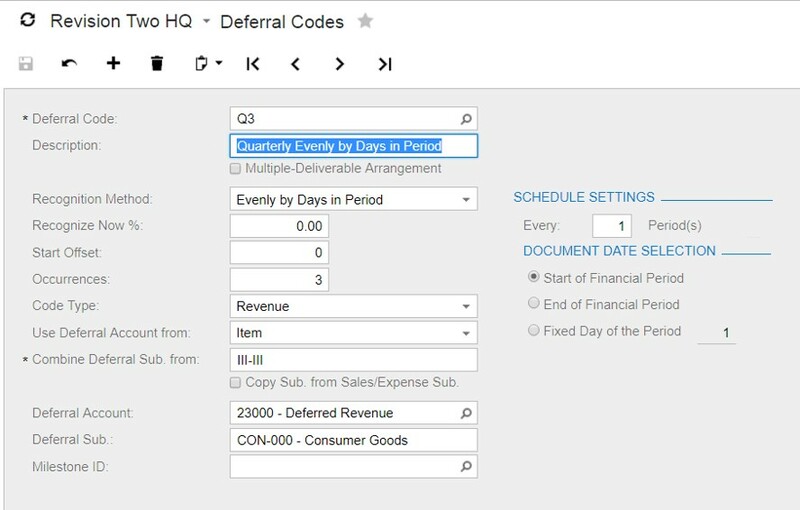 Besides choosing a recognition method, you must input the beginning and end dates. With the Evenly by Periods recognition method, the amount to be recognized is distributed evenly among all included periods. 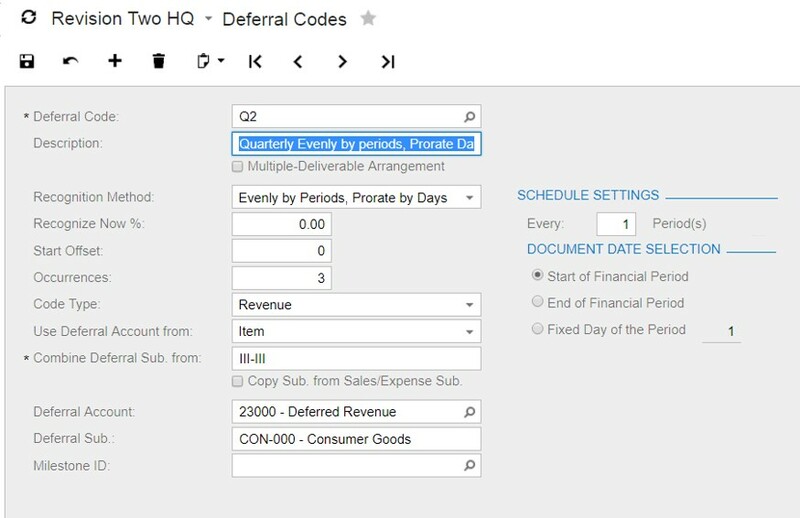 The number of recognition periods is defined by the value you specify in the Occurrences box for the deferral code on the Deferral Codes form. With the Evenly by Periods, Prorate by Days method, the amount to be recognized is distributed evenly among recognition periods (the number of which is defined by the value specified in the Occurrences box on the Deferral Codes form). The first and last periods are counted together as one recognition period and the amount to be recognized for each is proportional to the number of days in each period. The frequency of occurrences depends on the number of financial periods you select in the Every X Period(s) box. The installment amounts for the first and last periods are calculated based on a full-period amount that is proportional to the number of days each installment should cover. With the Evenly by Days in Period method, the amount to be recognized is distributed by periods with a proportional division by the number of calendar days in each period. 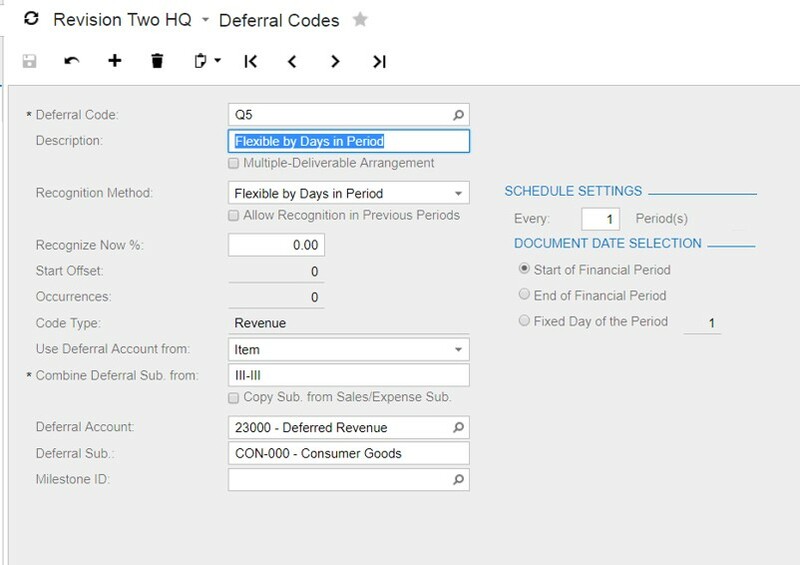 The number of recognition periods is defined by the value specified in the Occurrences box in the deferral code settings on the Deferral Codes form. 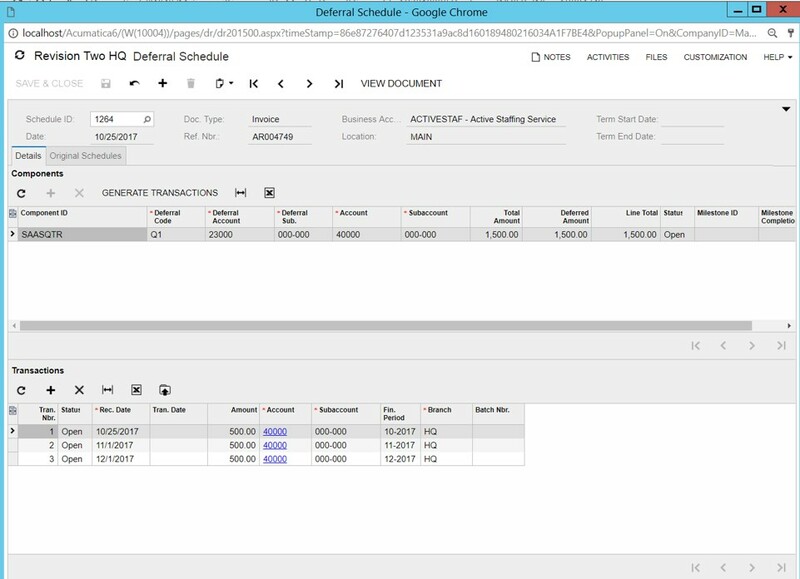 An occurrence is a recurring recognition event for which a recognition transaction is generated. The frequency of occurrences depends on the number of financial periods you select in the Every X Period(s) box. With the Flexible by Periods, Prorate by Days method, the amount to be recognized is distributed evenly among periods, with a proportional division by days among the first and last periods. 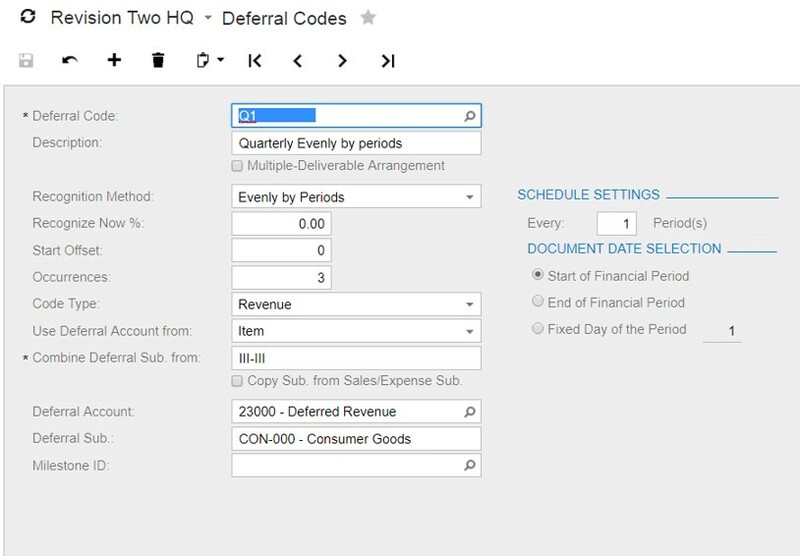 The first and the last periods may be less than a full period, depending on the start recognition date and the final recognition date specified in a particular document (such as AR invoice). The number of recognition periods is defined by the recognition dates specified in a document. With the Flexible by Days in Period method, the amount to be recognized is distributed among periods, according to the number of calendar days in each particular period. The start date and the final date of the recognition process is specified individually for each line of a particular AR document (such as AR invoice or cash sale). Microsoft Dynamics SL users have encountered a problem in which their application crashes when they attempt to transmit a credit card transaction. The problem is rooted in the TLS (Transport Layer Security) protocol, the cryptographic protocol that provides security over a computer network. MaxQ Technologies is a Microsoft Gold Business Partner and creator of advanced Microsoft Dynamics business solutions. Contact us to learn more about how MaxQ solutions for Microsoft Dynamics can help your business. We have been following the industrialization of cannabis manufacturing as the cannabis industry expands rapidly into a booming multi-billion-dollar business. An indicator of where things are heading is the large-scale expansion of MedMen, which is multiplying its production capability by creating three ultra-modern cannabis manufacturing operations in Nevada, California, and New York. MedMen launched the first of its new large-scale cannabis factories in April in Sparks, Nevada. At the opening ceremony, MedMen CEO Adam Bierman described the plant as the most advanced cannabis facility in the world. In May, MedMen began construction of a factory in Desert Springs, California, which is scheduled to open in 2019. A third factory will be built in Utica New York starting sometime this year. The Desert Hot Springs and Utica facilities will duplicate the $15 million Nevada plant, which features a 26,000-square-foot greenhouse with a fully controlled environment and a 19,000-square-foot manufacturing wing. Each factory will be capable of producing 10,000 pounds of high-quality cannabis annually. MedMen’s Nevada plant produces premium-grade cannabis products using the latest agronomic technology and sustainable techniques. The facility features state-of-the-art greenhouses manufactured in Holland, within which the company employs advanced growth methods while adhering to standards of the biotech and pharmaceutical industries. The cannabis plants are raised in a closed-loop, completely controlled environment in which computers monitor the temperature, humidity, and light to which the plants are exposed. All water used in the growing and processing of cannabis plants is recycled, and no pesticides are used. Contamination is kept to a minimum by requiring workers to don lab coats, scrubs, shoe slip-ons, and hair nets, and to immerse their hands in special scouring machines before entering the work environment. An advanced cultivation technique employed in the MedMen plant is a tissue culture lab that multiplies the cannabis plants through micro-propagation. Exceptional strains of cannabis plants are divided into multiple pieces to replicate them exactly and ensure consistency across all products. After a plant is divided, its pieces are regrown in a growth chamber for 20-40 days before being transferred to an acclimatization/vegetation room. The plants are nurtured in a flowering room with a 25,000-plant capacity that makes the facility one of the largest cannabis manufacturing facilities in operation. Lighting is adjusted to suit different phases of the growing process. State-of-the-art machinery pervades the entire MedMen operation. The trim room features a floor-to-ceiling safe that stores up to 1,000 pounds of flower and huge grinding and rolling machines that crush the flower and pump out thousands of pre-rolls. The extraction room houses a double-barreled extractor nicknamed “Mustang Sally” that compresses CO2 in the cannabis and produces crude terpenes. The refining room has most of its equipment enclosed in glass so that staff can view all stages of the process of refining terpenes, CBDs, and other extracts. The facility also includes an in-house laboratory to ensure consistency and plant optimization. Test samples are taken throughout the manufacturing process to determine whether all cannabinoids are being extracted from the plant material, whether the potency is in the target range, and whether all impurities have been removed. The facility has two kitchens that produce chocolates and baked goods. Over time, MedMen plans to produce tinctures, lotions, edibles, and drinks under its own unique brand, similar to Costco’s Kirkland line. Besides creating world-class manufacturing facilities, the company is raising the bar on dispensaries as well. In April, MedMen opened a new flagship retail outlet on Fifth Avenue in New York City that mimics the look and feel of Apple stores. The elegantly designed shop is staffed by well-trained sales assistants and equipped with iPads for customers to browse and research products. MedMed currently operates 12 cannabis outlets in California, Nevada, and New York, and plans to expand the number of dispensaries in Nevada from one to three. The company’s Sun Valley facility is used primarily as a research and development site to test different cultivation techniques and technology, such as LED lights. As The Cannabis Trend Report 2018 notes, driven by a revolution in cannabis research and farming techniques, the marijuana industry in five years will look very different than it does today. MedMen is among the companies leading the way in developing the manufacturing techniques that will make the next generation of cannabis production a reality. 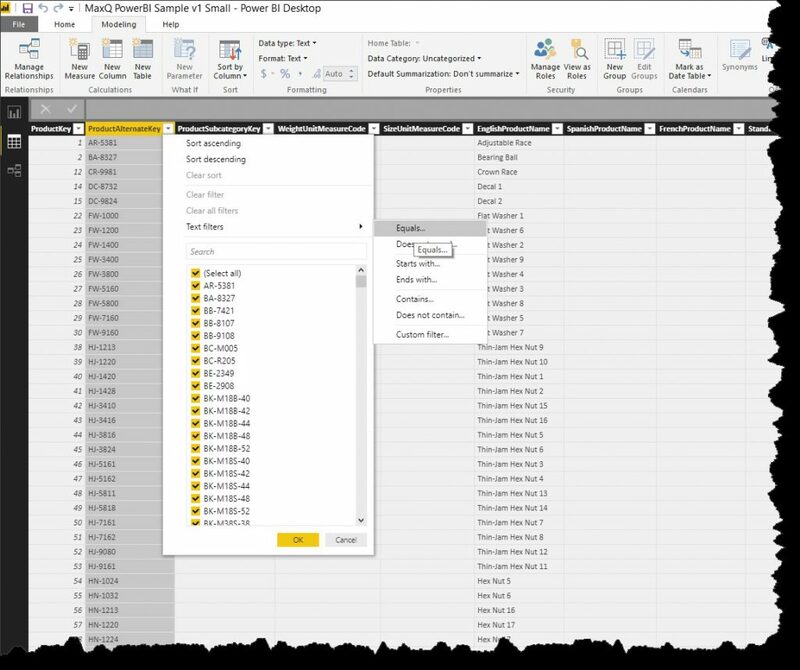 Power BI Desktop Adds Filtering and Sorting in the Data View – Finally! Veteran Excel users like myself, who use filtering and sorting in the data view of Power Pivot, were surprised and disappointed to find that Power BI lacked this capability. Early on I would build and debug a model in Power Pivot and would then import the Excel file to Power BI (this also allowed me to set a date table, another missing Power BI feature that has since been added). Lately I have been building models in Power BI, but many times have been forced to use Excel to debug and validate the data. Finally, with the June release of Power BI, we no longer need to resort to using Excel, making Power BI Desktop much more productive. Above: A Power BI Desktop screen showing the tool’s new sorting capability. 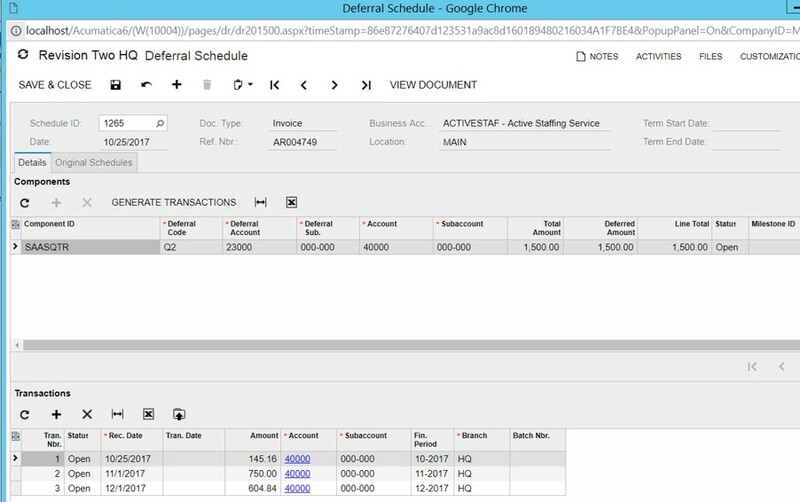 Contact us to learn more about how Power BI solutions for Acumatica and Microsoft Dynamics can help your business.